he Youth Activity Profile (YAP) is a self-report instrument designed to facilitate the collection of physical activity in schools (for both assessment and education purposes). The instrument was developed by our team and calibrated through a series of studies led by Dr. Pedro Saint Maurice for his dissertation research. An online version of the YAP was developed to facilitate use by schools. It is being used in the large NFL PLAY 60 FITNESSGRAM Partnership Project and has also been incorporated into the overall FITNESSGRAM battery as a school activity assessment. 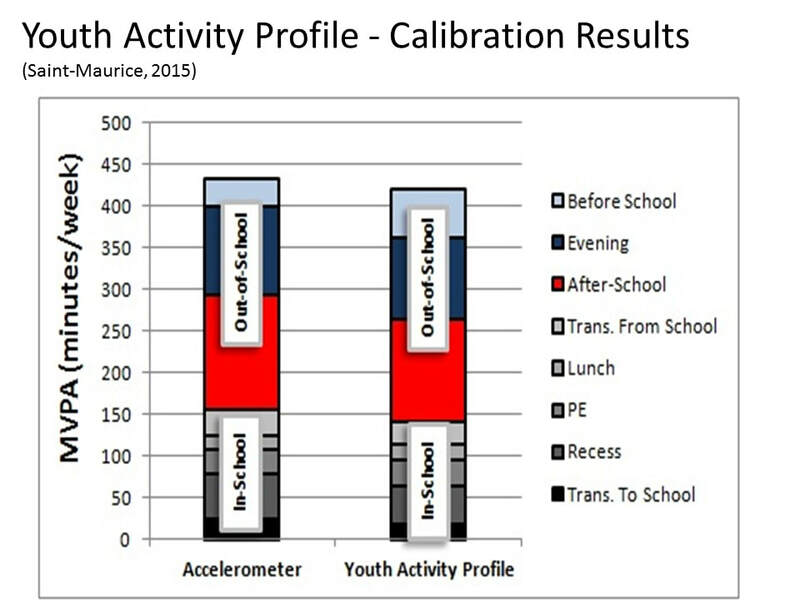 The innovative aspect of the Youth Activity Profile is that the items are calibrated to provide accurate estimates of physical activity (PA) and sedentary behavior. The figure at right shows the concept of calibration and the overall level of agreement for assessing PA in different segments of the day. Additional information is available from Dr. Greg Welk (gwelk@iastate.edu). Welk, G. J., Saint-Maurice, P. F., Kim, Y., Ellingson, L. D., Hibbing, P., Wolff-Hughes, D. L., & Perna, F. M. (2017). Understanding and interpreting error in physical activity data: insights from the FLASHE study. American journal of preventive medicine, 52(6), 836-838. Saint-Maurice, P. F., Kim, Y., Hibbing, P., Oh, A. Y., Perna, F. M., & Welk, G. J. (2017). Calibration and validation of the Youth Activity Profile: the FLASHE study. American Journal of Preventive Medicine, 52(6), 880-887. Saint-Maurice, P. F., Welk, G. J., Bartee, R. T., & Heelan, K. (2016). Calibration of context-specific survey items to assess youth physical activity behaviour. Journal of Sports Sciences, June 1-7. Saint-Maurice, P. F., Kim, Y., & Welk, G. J. (2016). Evidence for data missing at random in youth physical activity monitoring research. Journal of Sports Sciences, April: 1-7. Saint-Maurice, P. F., Kim, Y., Welk, G. J., & Gaesser, G. A. (2016). Kids are not little adults: what MET threshold captures sedentary behavior in children? European Journal of Applied Physiology, 116(1), 29-38. Saint-Maurice, P. F., & Welk, G. J. (2015). Validity and Calibration of the Youth Activity Profile. PloS one, 10(12).